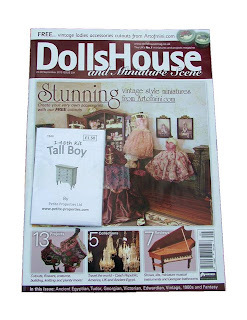 Don't miss the FREE Petite Properties' 1:48th furniture kit that comes with the latest September 2013 issue of Doll House & Miniature Scene Magazine! Whether you are a collector of smaller scales or not, the fabulous 1:48th scale furniture kits by AIM's founder member's Bea and Tony are a delight to see and collect. With easy to read instructions, these kits are a great starter project into smaller scales or to add to your current collection. There are five different furniture designs available, my little kit will sit proudly in my toyshop ... which one will you get?